50 days, four countries and 11 235km later, South Africa humanitarian and eco-warrior, Carla Geyser, has returned home having led a successful international all-women conservation mission into Southern Africa. Geyser’s Journeys with Purpose: The Rise of the Matriarch expedition spanned South Africa, Zimbabwe, Botswana and Namibia, and attracted 12 women from around the world. The figures are alarming: poachers kill approximately two rangers every week in Africa; they also kill on average 3 rhinos , 98 elephant and countless pangolin every single day. It is this harsh cold reality that spurred Geyser into action. “For most people on our planet, disaster on this scale is overwhelming so they resign themselves to shake their heads in dismay and leave the job of saving our people and wildlife to someone else. I have learned over the last few years that we simply cannot rely on ‘the other person’ or the next generation to take up the fight, it has to be us and it has to be now; we simply don’t have the time. And 12 brave women from around the world felt just as strongly as I do to leave the comfort of their homes and journey with me to make a difference” explains Geyser. The group of “eco she-roes” included eight South Africans – Lungile Dimba, an education administrator at wildlife body WESSA in the KwaZulu-Natal Midlands; Durban’s Erin Dickson, an on-air personality at East Coast Radio; Umzimkhulu’s Celokuhle “Smax” Biyela who is aligned to the Blue Sky Society Trust; conservation supporters, Laura Thomas-Gilks and Tarren Benson both from Durban, Pietermaritzburg photographer and eco-warrior, Stephanie De Wit; Bronwyn Laing, a Durbanite living in Tanzania; and real estate business owner, Joan Arnestad, from Hoedspruit, Limpopo. Four Americans joined the journey too, namely wildlife biologist and conservation scientist, Jennifer Palmer; nurse and travel blogger, Emily Scott; camerawoman, Alize Jireh Yaccino; and acclaimed business coach and conservationist, Tommi Wolfe. The eco-adventure kicked off from South Africa on 16 September 2018, under the banner of Geyser’s NPO, the Blue Sky Society Trust. 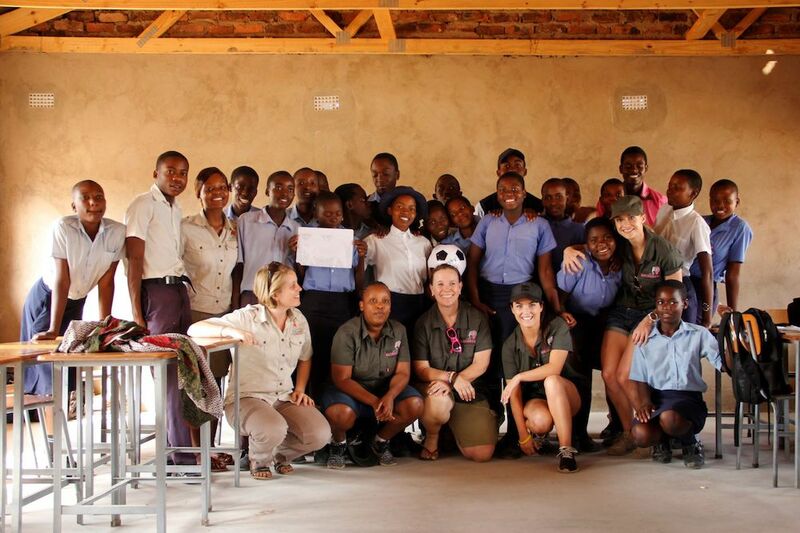 The mission had four distinct goals: to raise global awareness about the contentious human-wildlife conflict issue, to educate the youth about conservation, to support local empowerment efforts targeting young women from localised, rural communities, and to raise funds for four wildlife conservation bodies, namely Elephants Alive (South Africa), Rare and Endangered Species Trust (Namibia), Eco-Exist Project (Botswana) and the Soft Foot Alliance Trust (Zimbabwe). In the seven weeks that followed, Geyser and her crew, who joined her on different ‘legs’ or sections of the expedition, distributed 30 000 educational booklets, visited 13 on-the-ground conservation projects and met 16 phenomenal women who are doing incredible conservation work at a grassroots level. Spending time with the Eco-Exist educators and community officers in rural schools in the eastern panhandle of Botswana to learn about their daily challenges with elephants that raid crops and subsequent injuries and deaths of local community members was also memorable. “We saw a herd of over 400 elephants crossing the road, so it’s easy to see why people living in the area are so nervous and resentful of elephants,” says Geyser. Highlights for other crew members include meeting two of the brave Chobe Angels in Botswana. Kedi and Flo shared remarkable stories of bucking gender discrimination and gender stereotypes to prove that women are just as capable of tackling wildlife issues as men. 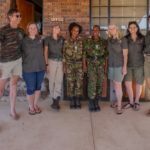 They are part of an incredible guiding crew of 22 women from Chobe Game Lodge who are committed to conservation efforts. The women also fondly recall the warm welcome they received from teachers and children at the A.Gariseb Primary School in the Damaraland, Namibia; meeting solo travellers and conservation champions from Germany and the U.K who had self-funded their trips to do their bit for the environment; and witnessing the success stories of the various initiatives spearheaded by women in the four countries.